This week brings two intriguing retail releases in Europe, published under Nintendo's eShop Selects label. FAST Racing NEO and SteamWorld Collection will be available on disc, and in the latter case Image & Form is also bringing the same compilation to North America (in October) with a different publisher. It's an important time for the Swedish studio, too, as SteamWorld Heist is finally making its move onto the Wii U (out now in Europe and due in October in North America). A hit on 3DS since December last year, and having since been released on PC and PSN, Nintendo gamers with a taste for HD visuals are finally getting their chance to jump into the SteamWorld universe again. We were big fans of the original on 3DS, and on Wii U it very much carries on the good work, albeit with much sharper visuals and greater detail. The Wii U GamePad also brings its advantages over other HD versions, helping to recreate the dual-screen functionality of the 3DS. It's a slick and attractive version of one of 2015's very best download games, which can't be a bad thing. With this Wii U release on the agenda we caught up with Image & Form CEO Brjann Sigurgeirsson to learn more about the sales performance of the 3DS version, the porting process to Wii U and how the Collection became a retail release. First of all, can you give an impression of Heist's sales performance on 3DS? It's been around 9 months since it was released, so have you been happy with its reception? I'm happy to say that SteamWorld Heist has done quite a bit better for us than SteamWorld Dig, and it's been the follow-up that we hoped for! We obviously felt the pressure after Dig did so well both in terms of sales and reception. Expectations from fans and pundits, as well as our internal drive to "use the window of opportunity" we created with Dig, were quite present at times. We really wanted to prove ourselves, that we could make something completely different and way better than Dig, that we could make games that were truly world-class. And we succeeded; Heist both feels bigger and scores way better than Dig. On Metacritic SteamWorld Heist is, together with Xenoblade Chronicles and Monster Hunter 4, the highest-scoring 3DS original title of 2015. But it wasn't easy; we had to make some tough decisions. One of them was releasing Heist in December 2015 rather than wait until February/March 2016. Like we're used to, we had bet the farm on Heist and were running out of cash (again). We could really use getting the game out in time for the holidays. The game didn't suffer - it was ready. But many of us thought that we had already spent 22 months making Heist, we could probably wait another 2-3 months to polish some detail or other. Nintendo offered to include us in a Nintendo Direct in November last year on the condition that we released the game before the end of 2015, and that made up our minds for us. Making Heist was incredibly hard, partly because it is so much more complex than Dig. We can see this when porting Heist - it takes much longer than porting Dig every time, even though we're much more familiar with the porting processes this time around. But another part of the difficulty was that, although we were inspired by particularly XCOM and Worms, no one had really made a game like Heist before. We spent much of the dev time experimenting, backtracking, pulling out our hair when stuff wasn't working or wasn't fun, and for long spells it felt like we weren't making progress. We spent much of the dev time experimenting, backtracking, pulling out our hair when stuff wasn't working or wasn't fun, and for long spells it felt like we weren't making progress. It's holding up very well. I'm beginning to think there's now a crowd - a good chunk of the Nintendo community - that buys our games because they're made by us. They're confident our games are a cut above the rest and worth playing. Also due to the staggered release schedule - 3DS in December, Steam/PSN in June - Steam and PSN sales are playing catch-up. When we look back at SteamWorld Dig, which had a similar stagger, we see that 3DS, Steam and PS4/Vita are now roughly equal in sales. So far Heist has fared better on 3DS and Steam than on PSN. Has working on the Wii U version been a smooth process for the team?With respect to NDAs, confidential data and so on, are you willing to say how sales on the portable have compared to subsequent releases on PC / PS4? No, it hasn't really been smooth. We've been running into all kinds of problems porting Heist, both internal and external. Like I mentioned above, porting Heist has been very much harder than porting Dig, and much has to do with the higher complexity of the game. For example, when we ported Dig to PS4, it was the first game ever to go through the PlayStation approval process on the first try. With that background, maybe we were over-confident in our porting abilities. We got through in the end, and the Wii U version is the best version of SteamWorld Heist to date. From your perspective, what are the key selling points of Heist on Wii U as opposed to 3DS? The two most obvious ones are the great benefits from using a more powerful system: full HD at a steady 60 frames per second. Suddenly all the FANTASTIC little details we spent almost two years adding to the game are allowed to shine. For example, the pilot of your ship - a bolted-to-his-seat robot called Wonky - has a pet plant, which was almost indiscernible on the 3DS. On the Wii U you not only see the plant, but you notice a sign that says that the plant is called Earnest. That was already there on the 3DS, but there was no way you were going to see it. Can you outline any other key Wii U-exclusive features, perhaps in terms of the GamePad screen etc? Yes, the third selling point is the versatility of the hardware. If you want to play off-TV, you can use only the GamePad if you like. And if you prefer to play on a TV screen - which I very much do - the GamePad consistently shows the map of the ship you're currently heisting. I find that's a huge advantage over other HD consoles, where you have to call up the map as an overlay. Having the map at your fingertips at all times is a great feature. In short, the Wii U brings the best of two worlds: the versatility of two screens and the beauty of HD graphics. For those that have missed the details up to now, can you sketch out the launch and loyalty promotions for the Wii U release? Yes, and that's very important! The regular price is $19.99/€19.99, and at release we'll run a 25% launch discount, so it'll be $14.99/€14.99. But if you own either SteamWorld Dig or SteamWorld Heist on any other Nintendo platform, you actually get a 33% discount. Nintendo are actually quite versatile this way. I think cross-buy promotions are a good idea, since you can reward loyal customers. You could argue that if you own the game on one platform you should get it for free on the other, but that would only be valid if porting doesn't entail any work to speak of and the experiences are more or less exactly the same. Doing it for PS4 and Vita makes sense, since making a Vita version based on the PS4 version is incredibly simple. In comparison, the 3DS and the Wii U are very, very different from each other. Notably, you also have SteamWorld Collection coming to physical retail. First of all, how exciting (on a scale of 1-10 Steambots) has it been to work towards seeing the game in stores? That would be... around 25 Steambots! Around ten years ago we made PC/Mac CD-ROM retail games for a Scandinavian publisher. While it was exciting to see stuff we had made on store shelves, they still weren't our games. This time it's completely different. And while it may sound very straightforward putting two existing games onto a disc, very much work must gone into testing and what have you. Everything has to work flawlessly, otherwise the whole batch of discs are useless. In this case, it feels very good to have Nintendo around to approve it. Starting with the European release through the eShop Selects brand, can you talk about how that came about? Did Nintendo of Europe approach you about it, or was it the other way around? Nintendo of Europe approached us, and it's actually a decent story! A German guy that I know at Nintendo of Europe called me up on the phone, and he mentioned that he had a few things to talk about. The first topic was exactly this, but I was in an elevator at the time and couldn't quite catch what he was talking about. I heard the words "Wii U", "physical" and "Nintendo Selects", but I wasn't connecting the dots - I couldn't really believe he was talking about making a SteamWorld product that Nintendo would distribute under the Nintendo Selects brand. So I ended that whole segment with a vague "...that sounds great..."
At the end of the conversation I asked him to repeat the first topic again, and indeed, that was what he had said. I wondered if we were talking about the same thing, since Nintendo Selects is more or less reserved for first-party titles. And he replied "Well, yes, first-party titles - and distinguished third-party titles." And so I replied with a more assertive "That sounds great!" You're publishing with a different partner in North America, can you tell us about that? NOA aren't using the Nintendo Selects brand like NOE does, so my immediate concern after agreeing to the Selects deal with Nintendo of Europe was to make sure that our fans and potential customers in the Americas got a corresponding offer. I called up my friends over at Rising Star Games (who ironically are a British publisher), and they were very happy to take this on. We've discussed physical releases with them in the past, so this was a perfect place to start. Are you surprised that the eShop Selects range is only in Europe so far, with no equivalent (yet) from Nintendo of America? With the avalanche-like developments of the mobile markets and Steam, I used to think it was only a matter of time before physical releases would be a thing of the past. But when enough people refuse to buckle, physical sales may diminish but not disappear. I'm always surprised when I see how differently NOA and NOE can operate. I'm sure there are reasons, but it feels good to know that NOA values our games as highly as NOE - at least it's nothing personal! Overall, how important are these physical retail releases for building the SteamWorld / Image & Form brand? I think they are more important than I first realised. 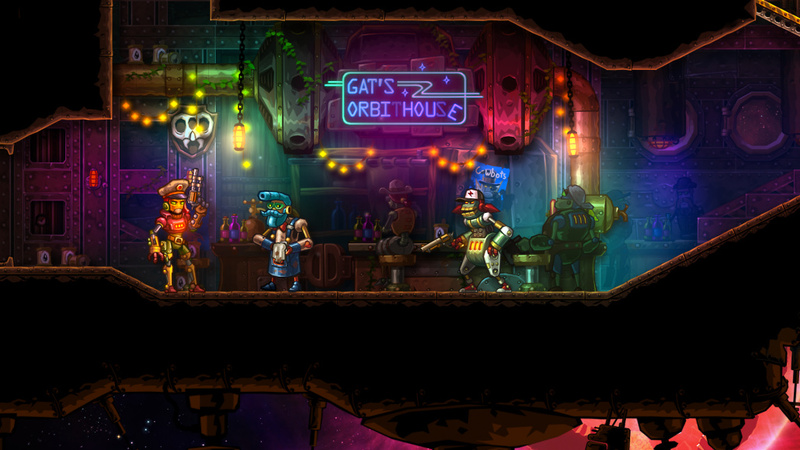 A lot of people don't buy games digitally, which means that they live in a world devoid of SteamWorld. It opens up a whole range of possibilities, since we have the games out for most platforms now. With the avalanche-like developments of the mobile markets and Steam, I used to think it was only a matter of time before physical releases would be a thing of the past. But when enough people refuse to buckle, physical sales may diminish but not disappear. Physical editions of your games appeal to a lot of people, and many gamers are also collectors. The big difference is that you'll have to act relatively fast if you're going to get your hands on a physical copy of SteamWorld Collection. Compared to digital versions of Dig and Heist, it won't be around for very long. Have you finished with SteamWorld Heist now, or is there more DLC / ports on the way? It depends - you'd be surprised if you knew how rarely we carve stuff in stone over at I&F. One week we think we're done, and then someone comes up with an idea for something, and then we're back at it. But soon we've been working on Heist for three years. That's a very long time any way you look at it. In any case, up until now there's been The Outsider, which will also be available for Wii U. 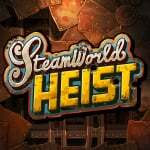 But in time for the Wii U version, we're launching two new DLC hat packs for SteamWorld Heist. One is free and the other costs €1.99, and they'll be available for all versions out there. What's next for Image & Form? You've said the next project will be related to SteamWorld, is there any more detail that you want to tease us with? SteamWorld Heist (Wii U eShop) and SteamWorld Collection (retail) are out now in Europe, and are due for an October release in North America. "You're publishing with a different partner in North America, can you tell us about that? I'm always surprised when I see how differently NOA and NOE can operate. I'm sure there are reasons, but it feels good to know that NOA values our games as highly as NOE - at least it's nothing personal!" It'll be interesting to see if this physically releases in the US and whether their version is tarnished with the horrible Selects branding. It's not quite clear what is happening there. Though it does show that NOA and NOE are quite disjointed. "I find that's a huge advantage over other HD consoles, where you have to call up the map as an overlay. Having the map at your fingertips at all times is a great feature." But, but, but, I thought Aonuma said having a map on the Gamepad was a distraction. “We realized that having something on the GamePad and looking back and forth between the TV screen and the GamePad actually disrupts the gameplay, and the concentration that the game player may be experiencing,” Aonuma said. I'm honestly okay with the Selects branding. I only had an issue when there were other ways to get a physical release on a Nintendo console. But in Steamworld and FR Neo's case, this is the only way to Europe. For that, I'm actually okay with their covers. Really nice interview, guy seems very honest, open and business savy. Good luck to them. @rjejr Having the map for Axiom Verge made the game that much better. When I played off tv it was quite annoying without that map on the gamepad. @Spoony_Tech But that's not what..
Oh wait, you're agreeing with me? It always throws me off when you do that. I'm playing Ni No Kuni, flying all over the world in my skell, I mean on my dragon, and I want to keep looking down to see where I'm going. 165 hours of XCX will do that to you. Map or no, I still hope Link gets a flying device in BotW. I wanted a hot air balloon at first, Zelda games are so slow paced, but now I want an eagle. Maybe they can make an eagle amiibo? I'll be giving the US physical as Christmas presents this year. After waiting a couple of weeks after it was originally released on 3DS I picked this game up and it is now one of my all time most played 3DS games. I am so excited for the physical release in NA! Nice interview and the games are great would too see Image&Form grow bigger and bigger with each game. This is one of my favorite games released this generation. The game is addicting, the visuals interesting, the story well thought out, the puzzles randomly generated so always interesting, and you can attack with different players and weapons. The variety is amazing. I plan on getting it in HD to further enjoy this gem and encourage anyone who hasn't done so to try it out. If you like strategy games this will be very enjoyable experience, and I think many more would enjoy giving this game a try. Definitely correct that people have developer loyalty. That's why brands are so powerful. They remind people that it's being made by the same devs that made "that other good thing". You guys really need to do something with more of a story though! NL I like all these interviews with Image & Form, keep it up! I already have steamworld dig on my Wii U, so I'm just gonna download Heist. @rjejr The return of the Loftwing being able to fly across Hyrule like the Skells form Xenoblade X? Please don't tease me with such a thought! Funny, that's what my kid said the other day when I told him about my idea for the eagle. Though he was much more sarcastic about it - "You mean the Loftwing?". Kids. If you haven't played Heist yet and you are even slightly interested in it, GET IT! So simple and in depth. And a fully fledged Steam Powered Giraffe soundtrack. Even tho they used previous songs in the soundtrack, they were re-recorded and even extended.